White House press secretary Sarah Huckabee Sanders did not mince words Wednesday when she was asked to follow up on her accusation a day earlier that Hillary Clinton's new election memoir contains false attacks. "Could you point us to a couple specific accusations in the book that you believe are factually incorrect?" a reporter asked. 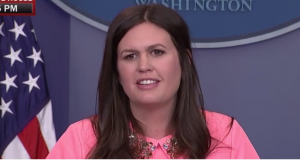 "I think probably the biggest one is any place within in the book where she lays blame for the loss on anyone but herself," Sanders said. Clinton has been promoting the book, entitled What Happened, over the past week. Delving into her 2016 election loss to President Donald Trump, she has laid blame for her defeat on, among other factors, James Comey, Bernie Sanders, the media, sexism, Russia, Facebook, and voter suppression.